Getting our Money's Worth from fossil fuel - Make's me wanna grab my Guitar and DRIVE my car! Submitted by Jeff Buster on Mon, 05/20/2013 - 22:56. Fossil fuels are the Gift that Keeps on Giving! First the fossil fuel heats up and expands the air in our V8 engine cylinders, then, after passing out the exhaust pipe (or chimney), the exhaust CO2 etc. heats up the globe - one local atmosphere at a time. 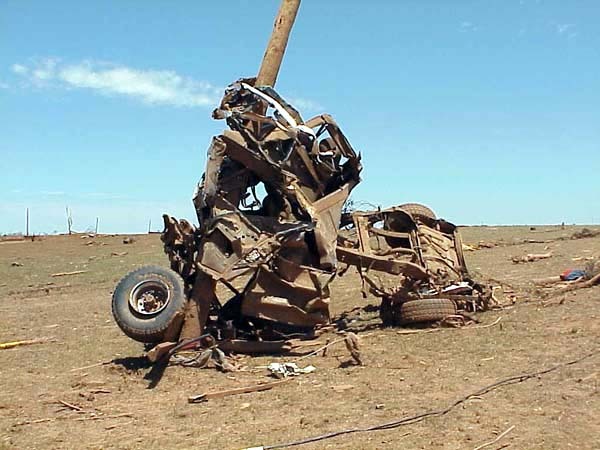 If you look at the images of the Oklahoma tornado, many images look very similar to a nuclear blast mushroom cloud. 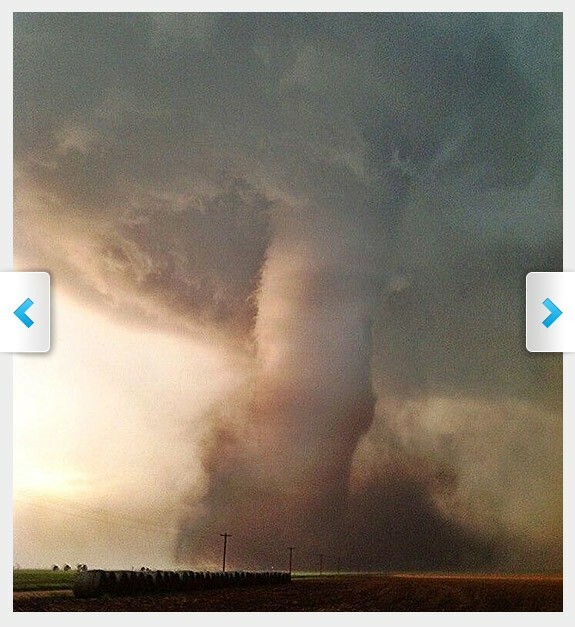 The image below is of Saturday's tornado: Shalyn Phillips tweeted this photo of a tornado in Kansas on Saturday and wrote, "We did it! @stormpics @Tornaduhs pic.twitter.com/axa6axEcTJ"
The reason the mushroom cloud and the tornado mushroom shaped structure look similar - is because of their thermal similarities. In the nuke, the heat is produced by chain reaction of electron splitting. In the tornado, the heat is produced by US! Man - so exciting! My car is a mini nuke! Skid my tires. Damn. I love power! 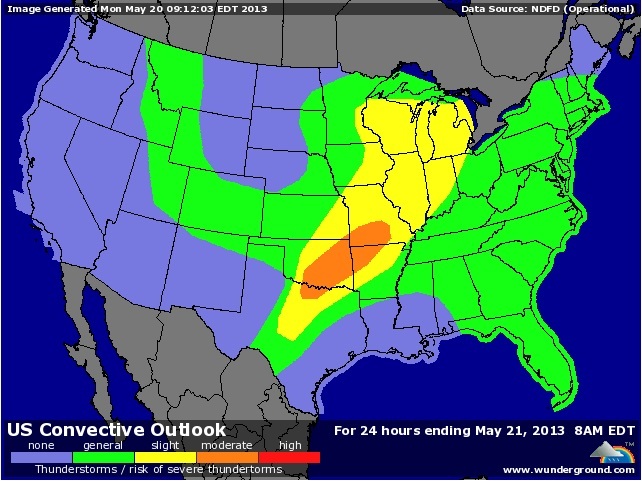 (not too, too funny, the RED states get all the tornados!) WTF? No Sidewalks - Good for Tornadoes! Submitted by Jeff Buster on Tue, 05/21/2013 - 19:04. 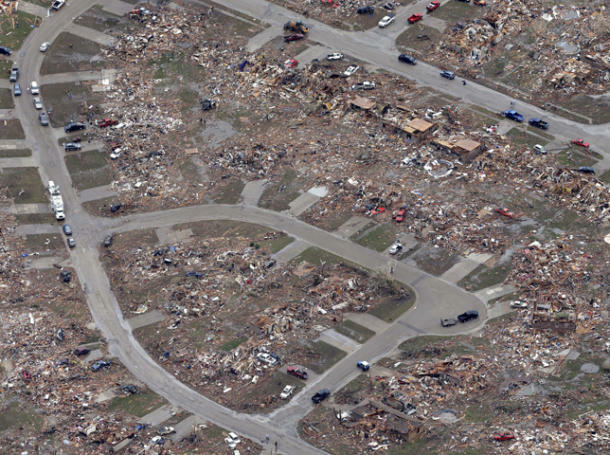 Here's an image of Moore, Ok.
Notice that there are no sidewalks along the street in the local community - sidewalks are on the straight street at the top of the image. Sidewalks are out in most zoning and planning discussions. Wasted dollars for the subdivision developer. And sidewalks interfer with automobiles. Town planners and zoning regulations do away with sidewalks. Eliminating sidewalks is also good for developing heat in the atmosphere. Makes me wanna drive my CAR! Submitted by Jeff Buster on Wed, 05/22/2013 - 09:45. Phys.org carries the AP story here. Where do you think all that fossil fuel energy goes after it goes out your exhaust pipe or up the chimney at the First Energy electrical generation plant - (same is true if the generation is nuclear)? Or does the heat just go into our global atmosphere and spin round and round? And create extreme "weather events"? These aren't "weather events", they are fossil fuel residual "waste" heat events. Not that there is much humor in the irony, but WE ARE NUKING OURSELVES!